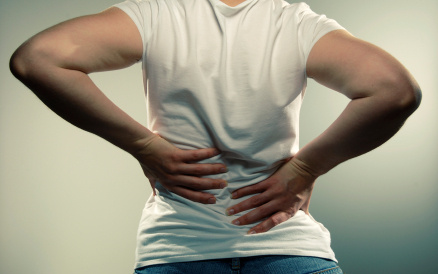 Back Pain is the most leading cause of disability around the world as some 632 million people suffer from it. According to the Institute of Medicine, one-third of all Americans suffer from chronic pain, which exceeds the number of people who are affected by heart disease, diabetes and cancer combined and the economic costs of medical care and lost productivity totals more than $550 billion annually. The back is an intricate structure of bones, muscles and other tissues. The spinal column also known as the spine is a construct of 30 bones or the vertebraes from the neck to the pelvis, which just not only supports the upper body’s weight but houses and protects the spinal cord or our delicate nervous system. There are seven cervical or neck vertebrae, 12 thoracic or upper back vertebrae, five lumbar vertebrae or lower back and a group of bones called sacrum and coccyx which are fused together at the base of the spine. The spaces between the vertebrae are maintained by round, spongy pads of cartilage called intervertebral discs that allow for flexibility in the lower back and act much like shock absorbers throughout the spinal column to cushion the bones as the body moves. Bands of tissue known as ligaments and tendons hold the vertebrae in place and attach the muscles to the spinal column. Being overweight puts strain on your back muscles. Maintain proper nutrition and diet to reduce and prevent excessive weight, especially weight around the waistline that taxes lower back muscles. A diet with sufficient daily intake of calcium, phosphorus, and vitamin D helps to promote new bone growth. Regular exercise can improve the overall strength and tone of the supporting muscles and structures. Abdominal and back muscle exercises (core-strength) help condition these muscles so that they work together like a natural corset for your back. If you are already ailing from backpain, please consult a Physical therapist before starting an exercise regimen. Consciously maintain a neutral pelvic position while sitting or standing. Sit in a chair with good lumbar support and proper position and height. A pillow or rolled-up towel placed behind the small of your back can provide some lumbar support. If you must sit for a long period of time, rest your feet on a low stool or a stack of books. Switch sitting or standing positions often and periodically walk around or gently stretch muscles to relieve tension. Normally back Pain is caused by incorrect way of lifting heavy weight, extensive overwork of the back or by over twisting/overstretching. The worst possible combination of activities for your spine is heavy lifting while bending and twisting simultaneously. Use proper techniques while performing strenuous exercise and strenuous work, including lifting. Lifting should be done with the legs performing the work, not the back. Use of a spine brace during heavy lifting may be advised. Its proper use is to keep your back straight and encourage proper lifting technique. It should not be used as a substitute for proper technique or to encourage you to exceed safe lifting limits. Always stretch before exercise or other strenuous physical activity. This occurs causing a sprain, strain, or spasm in one of the muscles or ligaments in the back. If the spine becomes overly strained or compressed, a disc may rupture or bulge outward. This rupture may put pressure on one of the more than 50 nerves rooted to the spinal cord that control body movements and transmit signals from the body to the brain. When these nerve roots become compressed or irritated, back pain results. Pain accompanied by fever or loss of bowel or bladder control, pain when coughing, and progressive weakness in the legs may indicate a pinched nerve or other serious condition. When the injured back heals itself, it does not have the strength or flexibility of normal tissue. Buildup of scar tissue from repeated injuries eventually weakens the back and can lead to more serious injury. Major Injury - If you have been involved in a car accident, fall from significant height, direct blow to the back or the top of the head or a high-energy fall onto the buttock with symptoms such as - being unable to move part of the body, severe back or neck pain, weakness, tingling and numbness in the arms or legs you should call for medical help immidiately. Minor Injury - This may occur from tripping, falling a short distance, or excessive twisting of the spine. Treat with ice or cold packs early after an injury and switch to heat later. Heat may be used early if the pain and symptoms are not caused by a sudden injury and are due to improper movement or posture, standing, walking, or sitting. Restriction of movement (bending and twisting) of the affected part is a must which is often accomplished by bed rest. It is very important to keep heed of this point by consciously devoiding your back and waist of any movement which can be supplement by using legs or arms as support. Most low back pain doesn't require a visit to a doctor and heals within 3 to 4 days. If the pain doesn't get 'better' even after 1 weeks and you can't do your normal daily activities, call your doctor. Devil's Claw - This herb eases muscular tension or pain in the back, shoulders and neck. A popular treatment for osteoarthritic pain, it may ease rheumatoid arthritic pain as well. Dong Quai - It has sedative, anti-inflammatory, analgesic and antispasmodic qualities. Arnica - It is an anti-inflammatory, mild analgesic and topical counterirritant that assists healing in cases of muscle strains, ligament sprains, bruises and sore muscles. St. John's Wort - It relieves back pain caused by nerve irritation that is sharp and lancing and involves numbness, tingling or burning sensations. Please consult a Naturopath Doctor to understand the dosage and interactions of the herbal medicines. Chiropractic Care - Chiropractors are doctors that specialize in spines. Acupuncture - A practitioner of acupuncture inserts sterilized stainless steel needles into the skin at specific points on the body. There are specialized nerve points in the body which can be manipulated with acupuncture to provide long term relief. Massage - Massage can be very useful as it helps relax the muscles and improves circulation of both blood and the body’s vital energy.